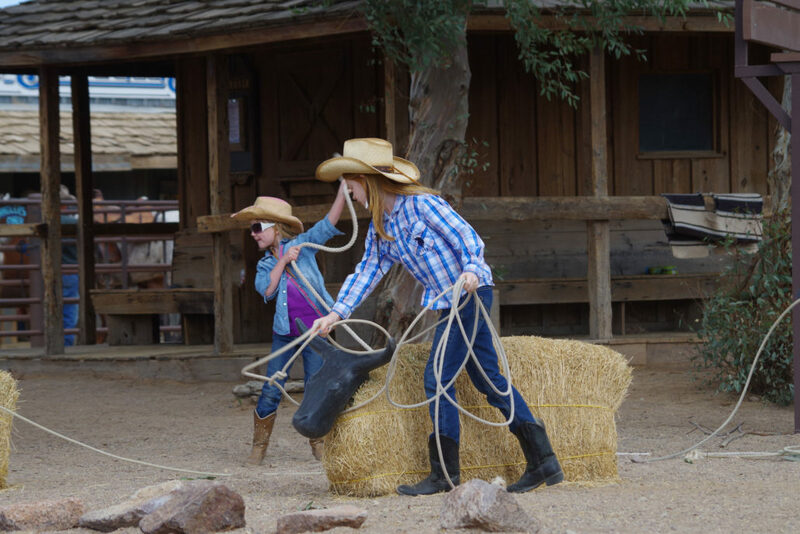 The activities provided for youngsters at award-winning Tanque Verde Ranch are geared to engage, educate, and entertain, in addition to teaching kids the importance of teamwork. Their programs include horseback riding, tennis, hiking, arts and crafts, swimming and nature programs, just to name a few, and are led by their caring and knowledgeable team will ensure a safe, fun and authentic southwest experience for your child. 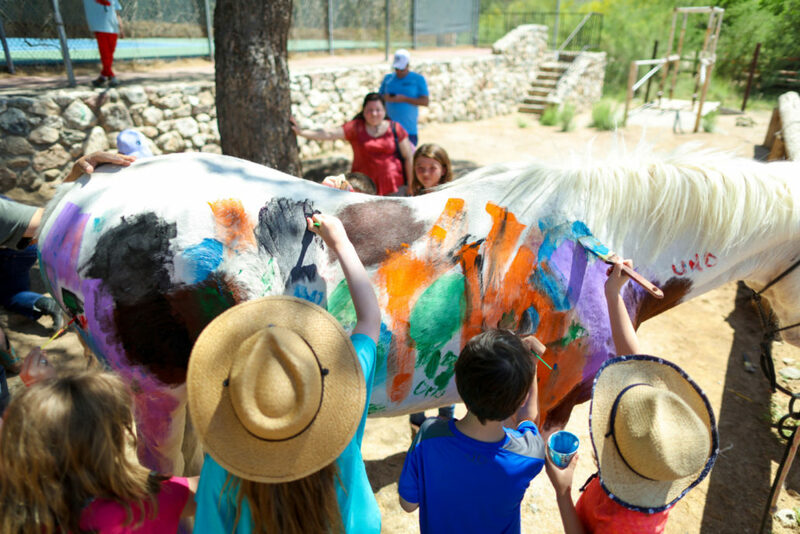 Tanque Verde Ranch offers a Daily Kids Program full of fun and activities for ages 4-12. 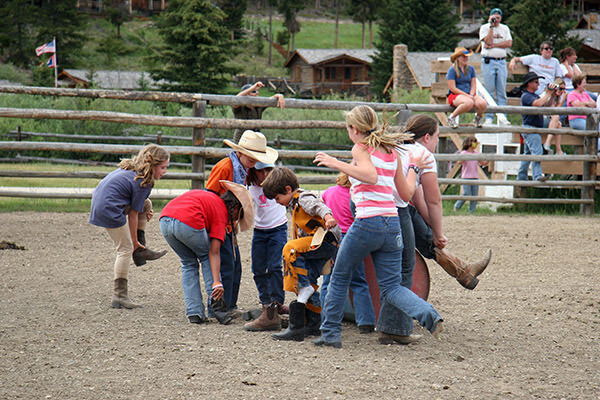 Grouped based on age – Buckaroos (4-6), Wranglers (7-9), and Outlaws (10-12) – riders learn the basics through a variety of age-appropriate horse activities. Looking to help your kids create memories that will last a lifetime? There’s also a summer overnight camp, provided by their sister company, Camp Lincoln and Camp Lake Hubert, with a history of over a century of creating fun and adventure in Minnesota’s lake country. Camp Lincoln and Camp Lake Hubert offer a variety of overnight camp choices during the summer season including Traditional 1, 2, 3, 4, and 8 week Camps, a 10-day Coed Camp, as well as several week-long Tennis, Family, and Golf Specialty Camps. Camp is more than fun! It is about meeting new friends, expanding one’s interests, learning new skills, and developing important life skills. Campers range in age from 5-17 and come from all over the United States and the world. From little wranglers to teenage cowpokes, Triangle X Ranch, in the heart of Grand Teton National Park, provides a fun and unique environment for kids. Freedom experiencing the outdoors and ranch life is the name of the game, but with the addition of terrific weekly programs for kids of all ages. Riding is the main activity for kids. Children as young as five get supervised instruction on horseback. Kids are each assigned their own personal mount from a group of the ranch’s most experienced saddle horses. Lead by a group of highly qualified kid’s wranglers, little wranglers enjoy riding lessons, games on horseback, swimming trips, horse painting, wildlife spotting, and several other fun destinations while out on their rides. Teens between the ages of thirteen and nineteen hit the trail on a ride designed just for them. Along with regular ranch and riding activities teens have the option to partake additional events such as overnight rides where they ride out to an old cowboy camp and spend the evening cooking their dinner over an open campfire, followed by a night of sleeping under the stars. Supervised by a male and female chaperone, teens are sure to enjoy their night out on the range. 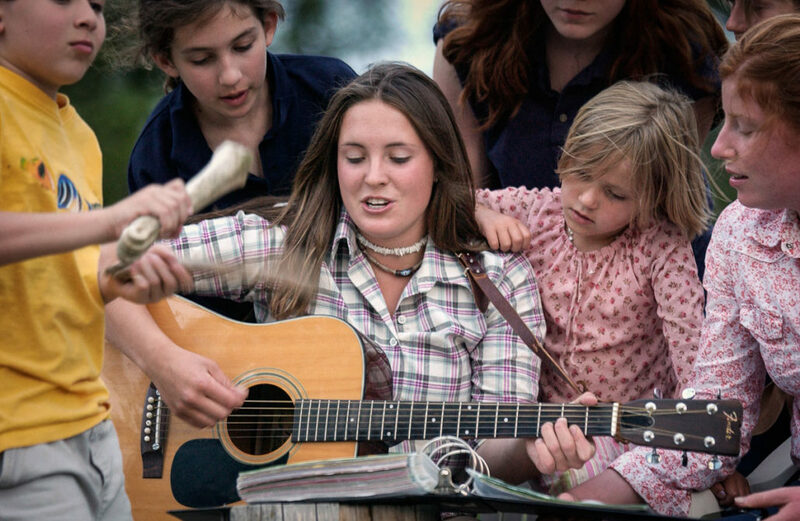 Kids of all ages will be made to feel right at home at British Columbia’s Three Bars Ranch – making for happy, little wranglers during the vacation and well beyond. The ranch offers wide, open spaces for your kids to be kids. They can catch frogs, go horseback riding, or cook marshmallows over an open fire. The ranch petting zoo gives them the opportunity to feed the sheep and gather eggs from the chickens. With so many new things to experience, a ranch vacation is a great way for kids to learn about nature and animals while having plain, old-fashioned fun. The program at Three Bars is age-appropriate and designed to keep kids of all ages busy all day long and well into the night. Being a ranch, of course, they offer youth riding programs based on age and ability. Providing the very best of their horses they are assigned to the youngest cowboys and cowgirls as their companion through the week. These horses have all been with the ranch for many years and have earned the team’s trust to take good care of their new riders. Kids’ rides are guaranteed to be interesting: riding out and building forts, catching frogs, or gold panning are just some of the places a kids ride might end up. If you’re looking to reconnect your kids to the outdoors and animals, Wyoming’s Paradise Ranch is sure to do the trick! Their award winning kids program exposes children to the natural world but also offers parents a chance to enjoy their own pursuits or spend time with their children having the knowledge and piece of mind that the whole family is being well taken care of. Arts and crafts, pony rides, talent show, kid’s fishing derby, kid’s rodeo and even overnight pack trips are just some of the great kid’s activities offered through the program. The program is all about FUN, of course, and is designed so parents can pick and choose time spent as a family and time spent in individual pursuits. The program takes all ages from infants through teens. The skilled and adept counselors are eager and ready to take your children through an experience the little dudes will remember for a lifetime. Offering your child the vacation of a lifetime, Lost Valley Ranch, located at the East Entrance of Yellowstone National Park in the Big Horn Mountains of Wyoming, offers kids the unique opportunity to learn the ways of the cowboy and experience life on an authentic Colorado horse and cattle ranch. Providing a variety of fun activities and outdoor adventures tailored by age and supervised by their team of hand-selected supervisors, kids get to experience ranch life first hand. The thoughtfully planned programs are designed by age group, allowing the littlest dudes to enjoy age-appropriate activities and games while giving teenage guests the freedom to enjoy authentic western experiences. Kids learn how to groom their own horses, get fitted to their own saddle, play in the barns and breath in the fresh mountain air while exploring the scenic natural surroundings. For kids ranging from toddlers to teens, from swimming, fishing and hiking to picnics and crafts, the memories your child will create will stay with them for years to come. 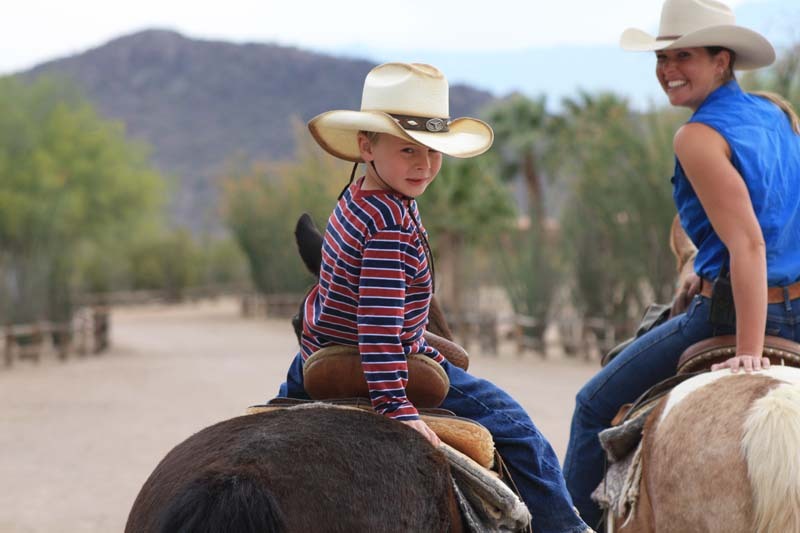 Arizona guest ranch, White Stallion Ranch, believes in the value of family time and offer a wide variety of activities for the entire family to enjoy. 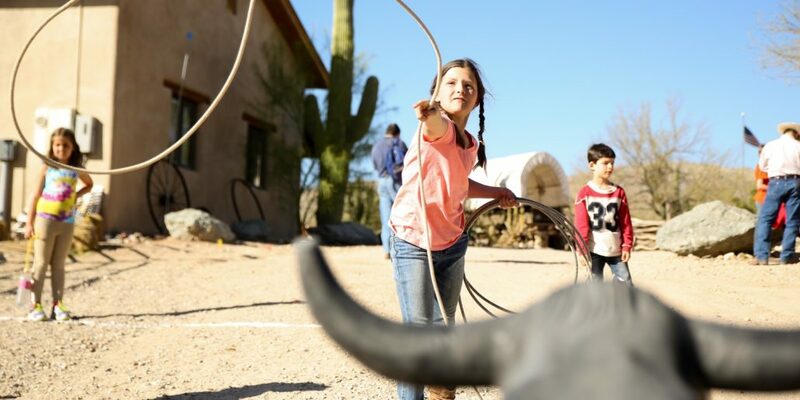 With 3,000 acres of lush desert adjoining the Saguaro National Park, this is a perfect place for kids to disconnect from the keyboard and grab the reins, discovering a whole new sense of freedom. This is an experience that will expand their world, pique their curiosity, build their confidence and create lasting family memories. Activities available run the gamut from riding, of course, to rock climbing and cookouts, to quiet games of chess and snuggling with storybooks in the living room. There’s also a lot more, including a movie theatre, fully equipped rec room, petting zoo, hayrides, and fun evening entertainment consisting of art classes, critter night, western line dancing, cowboy singers at campfires, educational presenters of local history and nature. 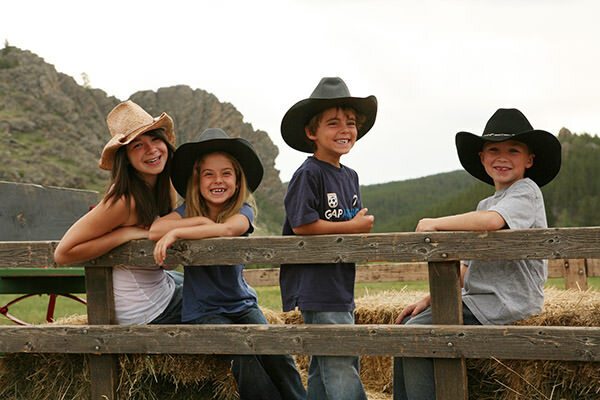 Your ideal Colorado family vacation, Rainbow Trout Ranch offers the perfect dude ranch, wild west experience for your family. Providing exceptional Colorado horseback riding, superb Colorado fly fishing, awesome children’s programs, a fun teen ranch program, trapshooting, swimming, day trips to Taos, white water rafting and the chance to ride America’s highest and longest narrow-gauge steam train, the dude ranch brings timeless simpler pleasures to life all in one spectacular setting. Kids programs for children as young as three are available under the supervision of qualified and caring counsellors. Programs are optional allowing families to choose according to what makes sense for their vacation and the amount of quality time they’re looking to enjoy. Children’s activities include riding, in the arena and on trails with expert instruction. Fishing, hiking, nature study, swimming, western crafts, PB & J lunch rides and more. Hayrides and everyone’s fave, hotdog ‘n smores roast, round out the experience. 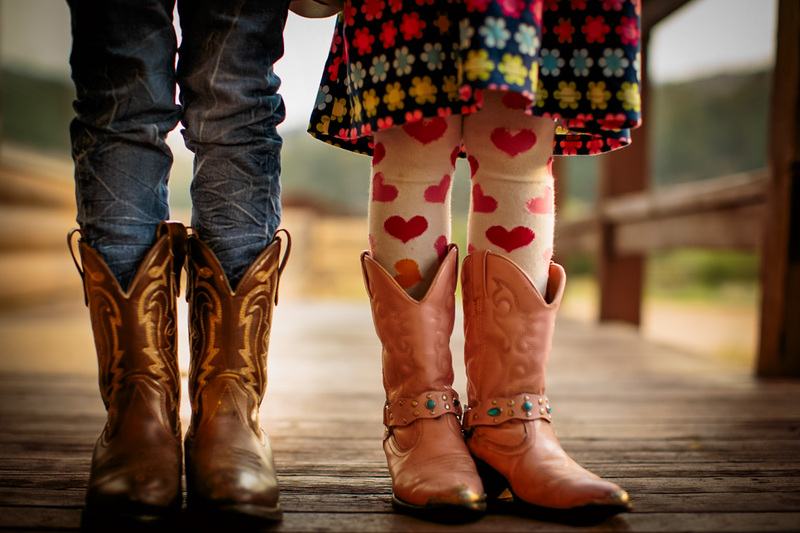 Whether learning to swing a rope, sing on a hayride, catching their first fish, or riding their first barrel run, Rainbow Trout Ranch is guaranteed to help create family fun and memories to endure! You may think that luxury resort experienced are a little too refined for your typical vacation… and they probably are! But, then again, Flathead Lake Lodge in scenic Montana is anything but typical. More like a family summer camp than your typical luxury resort, the staff is so personable and will welcome you and your family like their own. Owned by the Averill family for three generations and counting, they embrace your family as part of their family too. So welcoming is the Flathead Lake Lodge experience that many families make this unique adventure their summer tradition, coming back generation after generation to pass on the experiences they had as children to their own kids. The Lodge has a unique children’s program where family interaction is key and children have the freedom to safely roam the property and grow as they participate in various activities they like. 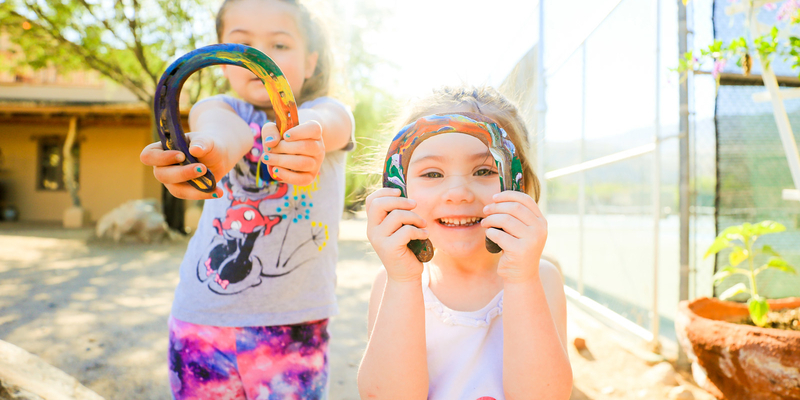 Children-focused activities include daily kids rides, daily arts & crafts, water activities, kids’ teepee camps, kids rodeo, organized games and a junior wrangler program to name a few. 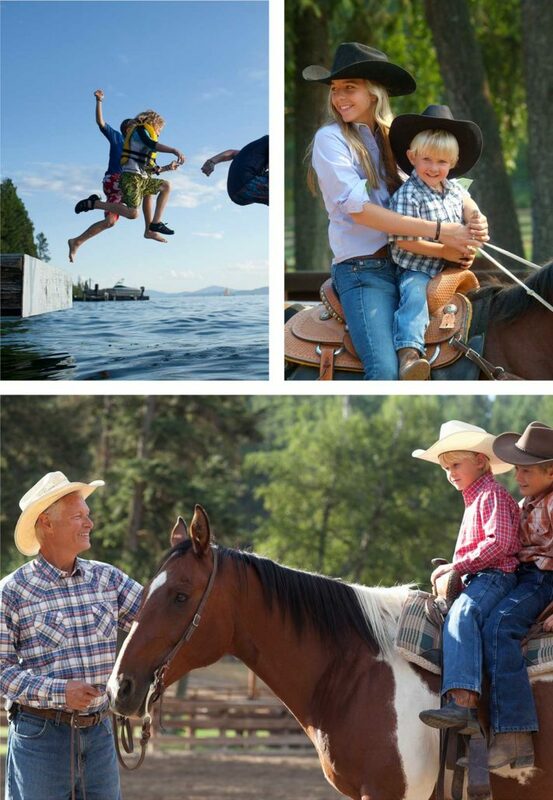 The Flathead Lake Lodge experience is specifically tailored to be enjoyable for families of all ages and stages of life. From toddlers to grandparents, the Lodge is the place for a family of any size to create lifelong memories. The team offers multi-generational activities from boat rides to barn dances to singing around the campfire working hard to create an environment where your family can spend quality time together. 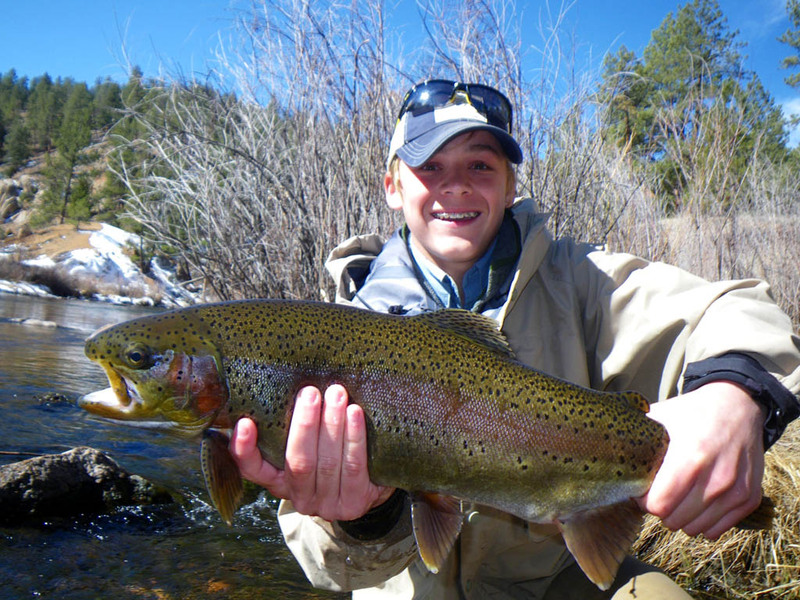 A Real Wild West Adventure: Wyoming Ranches Dude & Guest Ranch Vacations: Your Ultimate Fishing Adventure!